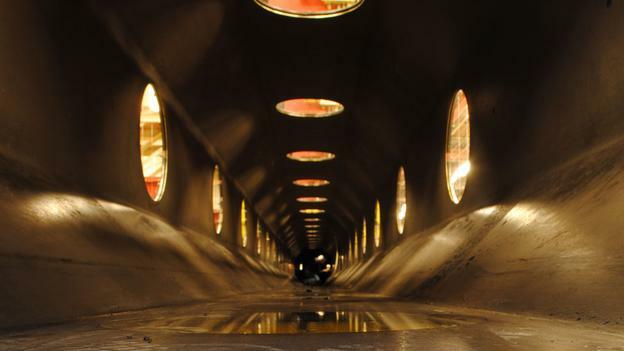 Looking down the barrel of the gun at NASA’s ballistic range (Credits: Boffin Media). BBC correspondent Richard Hoolingham had the opportunity to visit the facility where NASA tests spacecraft destruction. Accompanied by Chuck Cornelison, head of NASA’s ballistic range, Hoolingham was obviously impressed by what is referred to as the “fastest gun in the west.” Located inside the NASA Ames center in California’s Silicon Valley, the 45 meters long cannon has been used for assessing the atmospheric re-entry of spacecraft since the Apollo era. Among the projects recently carried out in the facility is the testing of the re-entry of the SpaceX Dragon capsule. So how does the “fastest gun in the west” look and what actually happens here? A metal pipe as wide as a man’s arm is mounted in the middle of a long windowless corridor: the barrel of the gun. After several meters, the barrel joins an oblong block of steel. From here, 4 cm diameter scale models of spacecraft, also called launch packages, are shot at the speed of 8km/s. This velocity is several times higher than the speed of a rifle bullet. It is achieved by propelling a piston by gunpowder through a pipe filled with hydrogen. As the piston compresses the hydrogen, the projectile is pushed along the barrel. “It’s a handful of milliseconds from start to finish,” says Cornelison. According to the scientist, when the gun is fired the whole building shudders and the team has to hide in an underground control room. 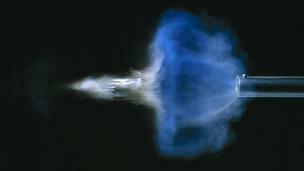 Snapshot of a bullet leaving a gun. Launches packages are propelled several times faster than a rifle bullet (Credits: SPL). After reaching the end of the barrel, the launch package enters the aerobalistic test section where its trajectory is monitored. To gather all the valuable data, 16 imaging stations are deployed along the test section , enabling capture of images of the projectile in different phases of its flight. These stations are still equipped with traditional film cameras. “This is old school,” Cornelison admits. At each station there is an 8 by 10 [inch] sheet of film and electro-optical shutter mechanisms with 40 nanosecond exposure time. “You can still get better detail with film,” he says. Using the images, detailed flight path of the object can be reconstructed. When the model reaches the end of the test section, it hits a thick polyethylene wall. Depending on the launching speed, the model either ends up embedded in the wall or completely vaporizes. For studying the impact characteristics, another facility is used. Even though not at all a cutting edge technology, the gun is still in demand as it is the only readily available method to verify computer models. “The computer models have really grown immensely,” explains Cornelison. “However, it’s a very complicated problem, there are a lot of different phenomena that occur – depending on the vehicle’s shape and the type of atmosphere you’re entering. And so there’s still a need to do tests like this to provide benchmark points that you can validate that the [computer] models are predicting reality,” he says. Recently tested within the facility was a brand new concept for Martian landing that might be suitable for a human expedition. As landing on the red planet is extremely difficult due to the thin atmosphere, several concepts have already been tested, the Curiosity’s Sky Crane being one of them. The newly proposed solution fits the landing capsule inside an inflatable ring that would expand the surface of the capsule and therefore increase the atmospheric drag. “This concept – if it pans out – would be a potential way to land larger payloads, even bigger than the Curiosity rover, with precision and without having to take a tonne of fuel along to slow it down,” explains Cornelison. The concept, according to the scientist, shows a lot of promise.